[Cookie Elf File] Lemon Crinkle Cookies: Just 3 Ingredients, No Measuring! Guilt-Free Cookies and Desserts … Yes, It’s Possible! Learn how to convert cookie recipes (and other desserts) into healthy, natural, gluten-free recipes in Guilt-Free Desserts. Learn more here. 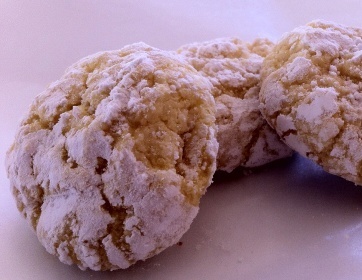 Feature: Lemon Crinkle Cookies - Just 3 Ingredients, No Measuring! Lemon Crinkle Mix Cookies are so-named because their tops crinkle after baking. Also sometimes known as Lemon Cake Mix Cookies or 3-Ingredient Cookies, these have (surprise) just three ingredients. And you don’t need to measure anything. Just dump all the ingredients into a bowl and combine them. 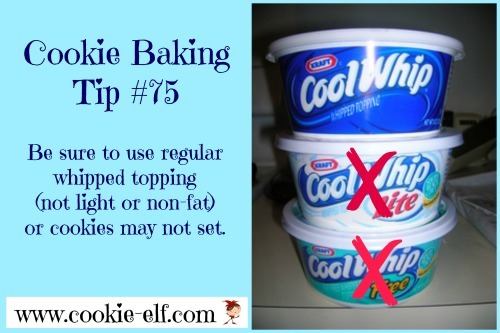 Then drop teaspoonfuls of the cookie dough into powdered sugar, gently roll them, and set them on a baking sheet. Surfaces crinkle when baked. The lemon flavor is perfect for spring! Makes about 3-4 dozen cookies Get the full recipe for Lemon Crinkle Cookies … and discover other cake mix cookie recipes on The Elf’s Cake Mix Cookie Pinterest Board.